Happy New Year! During the winter months, the pace slows down a bit at school. The hustle and bustle of the holidays is behind us, and we can settle in to some solid academic time with a few traditional winter events. January began with the annual National Geographic GeoBee on Thursday, January 3. Two students from each class in grades 4-8 competed to see who would be our school champion. That student took an online test to determine if he will qualify to compete at the state level. Over the past several years, quite a few St. Clare students have achieved this status. We wish him the best! We also look forward to the beginning of Drama Club rehearsals, field trips to OMSI, and Tryon Creek Park, time with our preschool and Providence friends, family groups, and a kindergarten cooking experience. 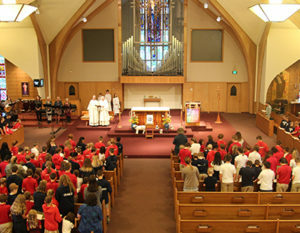 January ends with Catholic Schools Week from January 27-February 2. The first event of the week is our annual Open House, which will be held on Sunday, January 27, from noon-2:00 p.m. We look forward to sharing our wonderful school with all those who may be interested in joining our community! Other January events include a Mass and coffee-hour for our alumni and special friends, an OMSI assembly, and a pep assembly. February activities include a faith formation in-service day for the faculty and Valentine’s Day festivities. On March 2, we will come together at our annual auction, which is always a high-spirited celebration of our community. Did I say the pace would slow down? Yes, it truly does, yet we will accomplish a great deal. Please wish us well during these winter months. Our best to you!